Delaware is a rare state without independently elected prosecutors; the attorney general appoints them and sets policy, much like district attorneys do with their deputies elsewhere. This made the state’s attorney general election in 2018 a hot spot for criminal justice reform. The memo covers a wide range of areas from charging and plea-bargaining practices to youth justice and immigration. It instructs prosecutors to increase the use of diversion (for instance when it comes to offenses that involve marijuana), curb the use of money bail, limit the duration of probation, and take into account possible effects of prosecutorial decisions like deportation. The memo pays special attention to charging decisions and plea negotiations, areas of great prosecutorial discretion. It adopts a presumption against stacking multiple charges that come with mandatory minimums—a practice that empowers prosecutors in plea bargaining—and against tying diversion programs to a guilty plea. To directly reduce incarceration, the memo also recommends that deputies seek the lower end of sentencing guidelines when dealing with “routine misdemeanor or felony cases,” and that they seek probation or home confinement in low-level cases where the guidelines call for a sentence ranging from “0 to 12 months.” Much of the memo focuses on such low-level offenses, but there is also a recognition that all sentencing practices ought to be re-examined; one provision requires that prosecutors ask for authorization before seeking a sentence exceeding 20 years. The reach and scope of these reforms, therefore, still hinge on how deputy prosecutors interpret them and how much latitude they are given. Tack-Hooper praised the memo’s content as “very strong,” and “totally contrary to where prosecutors were a decade ago.” But he also noted the memo’s “reluctance” to loosen prosecutorial discretion and pointed to areas needing stronger commitments. “You could just say we’re not going to charge kids under 13 with a crime, period,” he said. Still, Tack-Hooper insisted that there is no getting around the need to modify deputy prosecutors’ behavior because impacting how they exercise discretion will always be crucial to reform. “Whether it will cause a sea change depends on how effective they are at changing the culture in addition to putting out these policies,” he said of the memo. It will not be easy for advocates to track whether this culture changes and apply public pressure, Tack-Hooper warned, because the memo does not improve data-gathering and transparency on matters like racial disparities in charging decisions. “If you open that to public scrutiny, it reinforces their ability to make the cultural changes that they’re trying to make,” he said. Other state proponents of criminal justice reform also praised the memo’s goals and provisions, while outlining avenues to make reform more robust. Chris Johnson, a lawyer who ran for attorney general in 2018 on a platform of “ending” mass incarceration, told me that the memo is “a victory for the criminal justice movement” that would not have been possible “three years ago”; he called the recommendation that prosecutors seek the lower end of sentencing guidelines “groundbreaking.” But he also warned that implementation will be the hard part, and he regretted that the memo did not go further on matters like seeking expungements and sentence modifications. Johnson believes that the attorney general should expand the resources devoted to reviewing past convictions and support safe injection sites. “To mention addiction and illness and not mention safe injection sites is wrong,” he said. “Many agencies will have to work together if you really want maximum criminal justice reform,” King said. Duval County votes for its sheriff next week, the first of more than 300 sheriff elections in 2019. Mike Williams, a Republican first elected in 2015, is running for re-election. He faces Democrat Tony Cummings, a former officer in the sheriff’s department. This Political Report reviews some of the stakes on policing practices, immigration, and transparency. Andrew Pantazi of the Florida Times-Union reported this month that the number of people shot by the police had dropped significantly over the past three years, and that it fell last year to its lowest level in at least 13 years. Pantazi also reported that the JSO had reviewed shootings involving 12 officers since Williams took office, and that “none of the 12 officers were required to undergo additional training or an internal-affairs review.” The JSO investigates shootings internally. Cummings has called for investigations to involve civilian oversight. In his January interview with the Political Report, he advocated for the creation of civilian review boards, which would require a change in state law, to counter the criminal justice system’s “inability to police itself.” Regretting that “the public is left in the dark because they have many many questions that go unanswered,” he called for them to have a “seat at the table.” He has talked of civilian review boards elsewhere on the campaign trail. Cummings also said he would train officers to arrest people less frequently, and to make greater use of civil citations. You can read the full version of this article, including a look at the stakes on transparency, here. Opponents of the death penalty got a boost in New Hampshire last week when the state House backed its abolition by an overwhelming vote of 279 to 88. That number represents more than two-thirds of the lower-chamber’s 400 members. The New Hampshire legislature already adopted a bill abolishing the death penalty in 2018, but neither legislative chamber had a supermajority in favor of repeal when Governor John Sununu, a Republican, vetoed it. But that changed in the 2018 elections, in part thanks to a Democratic surge. (The bill cuts across partisan lines, but Democrats have been likelier to support it.) Only 223 representatives voted for abolition in 2018, but the 279 who did so last week would be enough to override a new Sununu veto unless they change their mind in coming months. The bill now moves to the 16-member Senate. I reported in November that abolition proponents most likely seized a supermajority in the 2018 elections. Three Republican senators who had voted to keep the death penalty were replaced with Democratic senators who support its abolition. John-Michael Dumais, campaign director of the New Hampshire Coalition to Abolish the Death Penalty, told me in November that passing this bill would be “one more arrow in the quiver” of those who argue that the death penalty “doesn’t conform to our evolving standards of decency.” Might opponents of the death penalty also gain quivers elsewhere in the country this year? New Hampshire’s House is one of three legislative chambers that have voted to abolish the death penalty so far this year, the others being the Wyoming House and the Washington Senate. The abolition effort ultimately fell short in Wyoming last month, but Washington’s legislation is still alive and was referred to the House Public Safety Committee after passing the Senate. A spokesperson for Representative Roger Goodman, the committee chairperson, told me that Goodman plans to hold a hearing on the bill on March 25. Also this month: A repeal bill cleared a Colorado subcommittee; New York lawmakers proposed scrubbing the death penalty from state law; and legislation was filed in Oregon (where the death penalty cannot be outright abolished via regular legislation) to significantly and retroactively shrink the category of crimes it covers. And in California, Governor Gavin Newsom announced Wednesday that he would impose a moratorium on the death penalty via executive action. “I do not believe that a civilized society can claim to be a leader in the world as long as its government continues to sanction the premeditated and discriminatory execution of its people,” he said. He pointed to the risk of executing innocent people, and denounced racial disparities in the death penalty’s use. Of the 737 individuals on California’s death row, six in ten are people of color. Newsom’s order does not commute anyone’s sentence, though he said he may still do so, nor does it abolish the death penalty, a move that can be accomplished only through a referendum. Californians narrowly voted to keep the death penalty in 2012 and 2016; in 2016, they also voted in favor of a proposition to speed up executions. The earliest that a new abolition referendum could be organized is 2020. California joins Colorado, Oregon, and Pennsylvania as the states where executions are halted because of a gubernatorial moratorium. 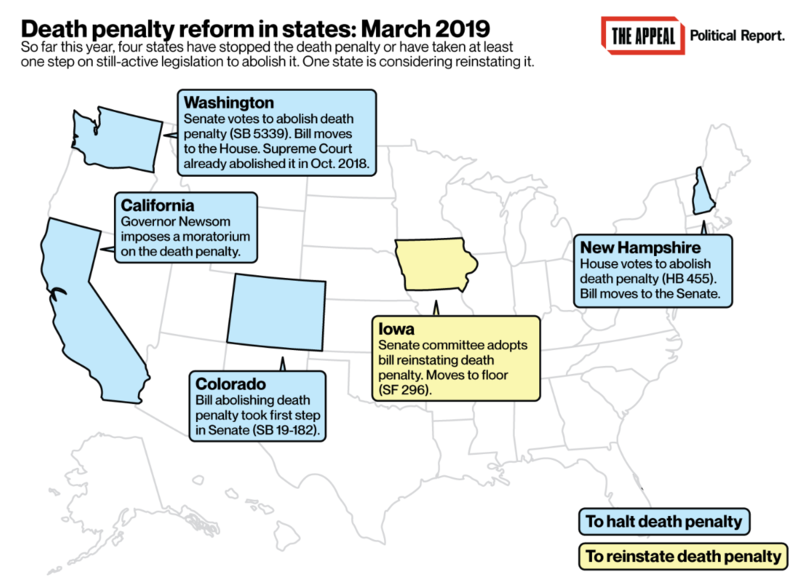 However, in at least two states lawmakers are moving forward with legislation to either facilitate or reinstate the death penalty. In Iowa, a bill to reinstate the death penalty made it out of the Senate Judiciary Committee last week, becoming eligible for full debate. Majority Leader Jack Whitver can now decide whether to call a full debate, which would be a first since 1995; Whitver did not respond to a request for comment as to his views on the legislation. Eight of the 10 Republicans on the committee voted in favor of Senate File 296; all Democrats opposed it. The GOP controls both legislative chambers, and Republican Governor Kim Reynolds has expressed openness to such legislation in the past. The standalone version of this story is available here. Arizona: Bills to overhaul Arizona’s criminal legal system fell by the wayside as the deadline for them to get out of committee expired. One proposal that advocates had rallied around was House Bill 2270, which aimed to lower the requirement that people serve 85 percent of their sentence before being eligible for release; another proposal would have enabled some people to expunge their record. While these bills and others were sponsored by Republicans, the Arizona Central and Arizona Mirror reported that they were largely blocked by Republican Representative John Allen, the chairperson of the House Judiciary Committee. Arkansas: The legislature has adopted Senate Bill 308, which restricts asset forfeiture to cases where an individual has actually been convicted of a felony. The conviction requirement, which also stipulates that the felony must relate “to the property being seized,” comes with exceptions, for instance if a person flees or does not show up in court. SB 308’s adoption comes in the heels of a U.S. Supreme Court decision that narrowed civil asset forfeiture. Both chambers passed the bill unanimously; the bill now heads to Governor Asa Hutchinson for his signature. Iowa: Marsy’s Law, a measure that seeks to enshrine a set of rights for victims in state constitutions, appears to have died for the year. It did not move out of committee by the required deadline last week, though legislative leaders can still resurrect certain measures. Marsy’s Law moved out of committee but was not called on the floor last year. Melissa Gira Grant reported in The Appeal in November on concerns that Marsy’s Law undermines the rights of defendants. New York: As Governor Andrew Cuomo and legislative leaders consider marijuana reform, they face demands from Black lawmakers that legalization include provisions to repair the disproportionate harm that prohibition has caused to people of color, the New York Times reports. North Dakota: Governor Doug Burgum has signed into law both of the bills the Political Report wrote about last week: One ends mandatory minimum requirements for some offenses involving drug manufacturing and dealing, and the other raises to 10 from 7 the age at which children can be referred to the juvenile justice system.